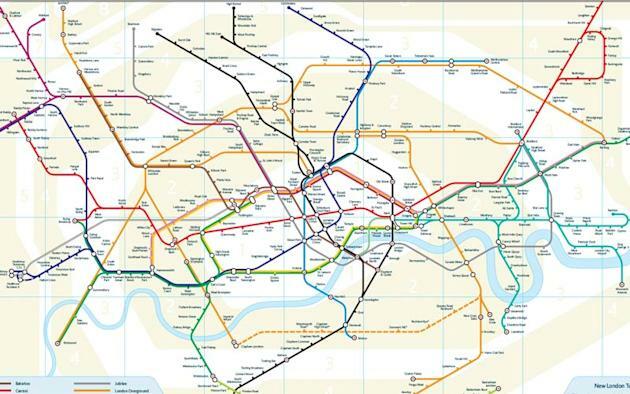 A man is attempting to change travel history after unveiling his own updated version of the iconic London Underground map. British designer Mark Noad has redesigned Harry Beck’s 1931 classic version to show the routes and distances between all London stations in a more geographically accurate way. According to Mr Noad, the map has nothing to do with Transport for London (TFL) but he has designed it in a way that still retains the clarity of the original. Explaining some of the changes on his project website, the major alterations include changing Beck’s 45-degree angles into 30- and 60-degree ones to shorten the extremities of the lines to make it more compact. The creator of the map also stated that there are twice as many lines today than when Beck designed his map with the London Overground line and DLR as examples of recent additions to this classic design. He is now said to be planning to take the new map viral by launching a new app for smart phones and develop a fully functional Website.